The most obvious sign of Sever's disease is pain or tenderness in one or both heels, usually at the back. 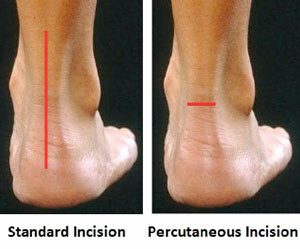 The pain also might extend to the sides and bottom of the heel, ending near the arch of the foot. A child also may have these related problems, swelling and redness in the heel, difficulty walking, discomfort or stiffness in the feet upon awaking, discomfort when the heel is squeezed on both sides, an unusual walk, such as walking with a limp or on tiptoes to avoid putting pressure on the heel. Symptoms are usually worse during or after activity and get better with rest. The treatment of Sever's disease depends upon the severity of symptoms experienced by the patient. Care is initiated with a simple program of stretching and heel elevation to weaken the force applied to the calcaneus by the Achilles tendon. If stretches and heel elevation are unsuccessful in controlling the symptoms of Sever's disease, children should be removed from sports and placed on restricted activities. Mild Symptoms. Wear a 3/8 heel lift at all times (not just during physical activity). It is important to use a firm lift and not a soft heel pad. Calf stretches 6/day for 60 seconds each. Calf stretches are best accomplished by standing with the toes on the edge of a stretching block. Moderate Symptoms. Follow the directions for minor symptoms and decrease activity including elimination of any athletic activity. In addition to stretching by day, a night stretching splint can be worn while sleeping. Severe Symptoms. Follow the directions for mild and moderate symptoms. Children should be removed from sports activities such as football, basketball, soccer or gym class. A below knee walking cast with a heel lift or in severe cases, non-weight bearing fiberglass cast, may be indicated for 4-6 weeks. The cast should be applied in a mildly plantar flexed position. Cam Walkers should not be used for Sever's Disease unless they have a built in heel lift. What Should We Do About Achilles Tendinitis ? Achilles tendonitis is a relatively common condition characterized by tissue damage and pain in the Achilles tendon. The muscle group at the back of the lower leg is commonly called the calf. The calf comprises of 2 major muscles, one of which originates from above the knee joint (gastrocnemius), the other of which originates from below the knee joint (soleus). Both of these muscles insert into the heel bone via the Achilles tendon. During contraction of the calf, tension is placed through the Achilles tendon. When this tension is excessive due to too much repetition or high force, damage to the tendon occurs. Achilles tendonitis is a condition whereby there is damage to the tendon with subsequent degeneration and inflammation. This may occur traumatically due to a high force going through the tendon beyond what it can withstand or, more commonly, due to gradual wear and tear associated with overuse. NSAIDs help decrease swelling and pain or fever. This medicine is available with or without a doctor's order. NSAIDs can cause stomach bleeding or kidney problems in certain people. If you take blood thinner medicine, always ask your healthcare provider if NSAIDs are safe for you. Always read the medicine label and follow directions. Steroid injections. Steroids decrease pain and swelling. After you get this shot, you may feel like your Achilles tendon is healed. Do not return to your regular exercise until your caregiver says it is okay. You could make the tendinitis worse, or even tear the tendon. Surgery. If your tendinitis does not heal with other treatments, you may need surgery. Surgery may be done to repair a tear in the tendon, or to remove parts of the tendon. The most important way to manage Achilles tendinitis is to rest. Rest decreases swelling and keeps your tendinitis from getting worse. You may feel pain when you begin to run or exercise. The pain usually goes away as your muscles warm up, but it may come back. Your caregiver may tell you to stop your usual training or exercise activities. He may give you other exercises to do until your Achilles tendon heals. Ice decreases swelling and pain. Put ice in a plastic bag. Cover it with a towel. Put this on your Achilles tendon for 15 to 20 minutes, 3 to 4 times each day. Do this for 2 to 3 days or until the pain goes away. After 2 or 3 days, you may use heat to decrease pain and stiffness. Use a hot water bottle, heating pad, whirlpool, or warm compress. To make a compress, soak a clean washcloth in warm water. Wring out the extra water and put it on your Achilles tendon 15 to 20 minutes, 3 to 4 times each day. Stretching and making the muscles stronger may help decrease stress on your Achilles tendon. Physical therapists can teach you exercises and treatments to help your tendinitis heal faster. You may need to wear inserts in your shoes. You may need to wrap tape around your heel and back of the leg. You may need to wear a cast, brace, or support boot. Surgery is considered when non-operative measures fail. Patient compliance and postoperative management is an important aspect of the operative management to prevent ankle stiffness or recurrence of the symptoms. Surgery usually requires a removal of the damaged tissue (debridement) and meticulous repair of the tendon. Post-operative immobilization is required, followed by gradual range of motion and strengthening exercises start. It may require 6 months for the full recovery. Some known complication are recurrence, stiffness of the ankle and deep vein thrombosis. What Is The Major Cause Of Achilles Tendonitis ? 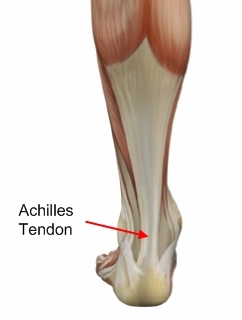 Achilles Tendonitis is an inflammation of the Achilles Tendon. This tendon attaches the muscles in the calf of the leg to the back of our heels. The Achilles Tendon is a long and thick tendon, which moves our foot down, so that the toes point to the ground (plantar flexion). This tendon can become inflamed due to the following causes. Over utilizing it, such as too much running, especially up or down hill. Trauma, such as a kick to the tendon. Shoe or boot pressure, especially at its attachment to the heel, or just above it. There are over 250,000 injuries to the Achilles Tendon annually. In fact, more Than 10% of all running injuries are to the Achilles tendon. Tendonitis may be classified as either acute or chronic. Acute Achilles Tendonitis comes on quickly, usually after a specific activity or event. It is characterized by an overstretching or tearing of some of the small fibers of the tendon, and causes pain or tenderness when walking or running. It can occur at the insertion (near the attachment to the heel bone, or further up the leg, about 4 or 5 inches above the heel. Acute tendonitis can also follow a specific injury, such as a kick to the tendon while playing soccer. Chronic Achilles Tendonitis develops gradually over time. Many times, you can feel an obvious thickening of the tendon that may be tender when squeezed, due to long standing scarring of the tendon. Pain is also present when walking or during other forms of activity, and feels better at rest. On examination, an inflamed or partially torn Achilles tendon is tender when squeezed between the fingers. Complete tears are differentiated by sudden, severe pain and inability to walk on the extremity. A palpable defect along the course of the tendon. A positive Thompson test (while the patient lies prone on the examination table, the examiner squeezes the calf muscle; this maneuver by the examiner does not cause the normally expected plantar flexion of the foot). Suggestions to reduce your risk of Achilles tendonitis include, icorporate stretching into your warm-up and cool-down routines. Maintaining an adequate level of fitness for your sport. Avoid dramatic increases in sports training. If you experience pain in your Achilles tendon, rest the area. Trying to ?work through? the pain will only make your injury worse. Wear good quality supportive shoes appropriate to your sport. If there is foot deformity or flattening, obtain orthoses. Avoid wearing high heels on a regular basis. Maintaining your foot in a ?tiptoe? position shortens your calf muscles and reduces the flexibility of your Achilles tendon. An inflexible Achilles tendon is more susceptible to injury. Maintain a normal healthy weight. Many of the muscles that move the foot are found in the lower leg. These muscles attach via tendons to various bones in the foot. The main muscles that move the foot downwards (plantar flex the foot) and propel the body forward are the calf muscles (gastrocnemius and soleus muscles). These muscles are connected to the heel bone (calcaneus) by the "rope like" Achilles tendon. Achilles tendon rupture is the term used to describe a complete tear of the Achilles tendon. 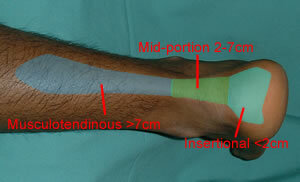 The most common site for Achilles tendon rupture to occur is an area 2 - 6 cm. (1 - 2.5 in.) 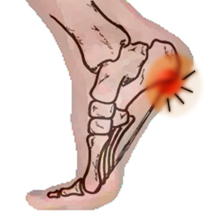 above where the tendon attaches to the calcaneus. A diagnosis can be made clinically, but an MRI or ultrasound scan can confirm it. On examination, the patient will present with reduced plantarflexion strength, a positive Thompson test and potentially, a palpable gap in the Achilles. The whole length of the tendon should be examined to check for injuries that can occur at the insertion and the musculotendinous junction. A tight or strained piriformis (deep gluteal) muscle can be a real pain in the buttocks - literally. In addition, the sciatic nerve (the biggest and longest nerve) is so close to the muscle that, when the two connect, irritation occurs. Desk Jockey Fitness claims that, for about 15 percent of people, the nerve actually penetrates the muscle and causes pain. Overuse, tightness and inflammation of the piriformis might mimic sciatica (pain felt in the low back and down the back of a leg). But exercises that can be done anywhere can minimize piriformis pain. There are different types of surgical procedures that are used in treating various conditions causing back pain. Nerve decompression, fusion of body segments and deformity correction surgeries are examples. The first type of surgery is primarily performed in older patients who suffer from conditions causing nerve irritation or nerve damage Fusion of bony segments is also referred to as a spinal fusion , and it is a procedure used to fuse together two or more bony fragments with the help of metalwork. The latter type of surgery is normally performed to correct congenital deformities or those that were caused by a traumatic fracture. When your legs and arms are numbed and tingling and you are losing control of their movements, this is a sign that your spinal cord is damaged. The pain in the back spreads from the lower back to the buttocks then to the thigh and down to the calves and toes. Second-Acute back pain is dull and piercing down your back that may last from 3 to 6 months, you may be feeling a kind of dull ache all the time. Chronic soreness is felt in the middle and lower back especially after standing or sitting for a long period of time. Most of the time, back pains lead to the development of neck pains and headache pains. Most back pains start as acute pain and later become chronic pains. Acute back pains start suddenly and these usually result from other conditions and go away after the conditions are treated. However, chronic pain has unknown causes and does not go away easily. It is important for you to make sure that you visit professional such as Hope Family of Pain Centers to provide you with joint pain relief With their help, you will be able to deal with your chronic back pain condition effectively. One wonders as to how Diagram and Back Pain are related. Back Pain is the most common and single largest cause of sickness absence universally. Normally back pain is not a serious illness but it can be very painful. Lower back pain medical term for which is 'Lumbago' affects at least once in a lifetime of almost more than 70% human beings. Low back pain is a stiff achy pain anywhere on the back right from bottom of the ribs up to top of the legs. Pain in the lower back could be a probable symptom of damage to muscles or ligaments. The spinal column is made up of vertebrae that sit in a column with spongy discs between them. These discs are jelly-like, but occasionally they can tear. When they tear, the jelly inside can leak out and cause a herniation. This is a bulge that can push against the spinal cord or any of the nerves that come out from it. When this happens, the patient will usually experience pain, numbness and tingling in the area that the nerve supplies feeling to. There are treatments for disc tears that range from conservative, such as medications, to radical, such as surgery. The initial step would be to merely see a medical doctor and have your whole body analyzed extensively to make certain what sort of problem you have and what has triggered it. Sometimes back pain is is very hard to pinpoint as generally it is brought on by probably the most trivial of elements by which you could not visualize. In most cases it is said that back pain develops regardless of their age may requirerequire back pain management at some point in time as the joints and muscles also need a particular movement to stay in good shape. Back pain may be combined with pain into the leg, travelling down below the knee, this is otherwise known as sciatica, because the main nerve to the leg (the sciatic nerve) is being irritated by pressure on it. In this section I have been talking about what we term simple or mechanical back pain , which is far and away the most frequent cause of low back pain There are various other symptoms which may go with back pain , some of which suggest problems other than back problems, and some of which point to the need for more urgent action by you and your doctor. One of the reasons people experience back pain is because they have weak muscles which do not support the spine adequately. One of the best ways to strengthen muscles is through exercise, all you have to do is ingrain a few exercises in your routine. Taking medication for your back pain will give you relief but it's a short-term remedy. Exercising your core muscles will help you build strength and stability thereby avoiding back pain. A simple routine of back pain relief exercises followed at home can prevent and even eliminate any pain that you might experience. The gold standard for making a diagnosis of SI joint dysfunction is a fluoroscopically guided SI joint injection. Fluoroscopy is needed to accurately and consistently inject the sacroiliac joint. Only 12% of patients had intra-articular SI joint injections when fluoroscopy was not utilized (3). Also important is to anesthetize the entire SI joint complex. In my experience as an interventional pain physician this cannot be consistently done by palpation alone, especially in obese patients. It is humbling to see anatomy change under fluoroscopic guidance. What you perceive with palpation is sometimes markedly different than the actual location of the structure that you palpate.